Peel tomatoes and cut them into pieces eliminating the seeds. Put them into a blender's jar. Cut Iberico Ham into small pieces leaving out those which may be hard or dry. Blend together with the tomatoes until you obtain a cream. Add olive oil while still blending until mixture is emulgated. Set aside. Extend a sheet of paper or silicon on the oven tray and put the slices of Iberico Ham on top. Cover with another sheet and put a weighton top. Keep this at 180 C for 10 minutes or so. Then check if the slices are crunchy but not dry, so they won't break when we use them. Toast the bread and cut in half. 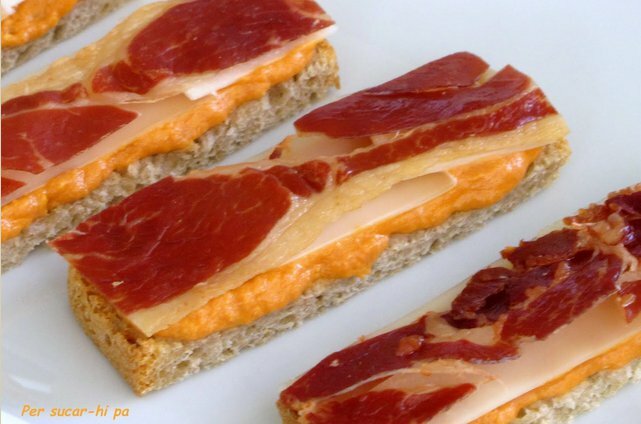 On each half, put a layer of your tomato cream, on top a thin slice of queso manchego curado y cortado and finish it off with a slice of Iberico Ham!